Hey broseph, don't you make me pop a cap with my bad arse! You know a brother is motivated to get his. 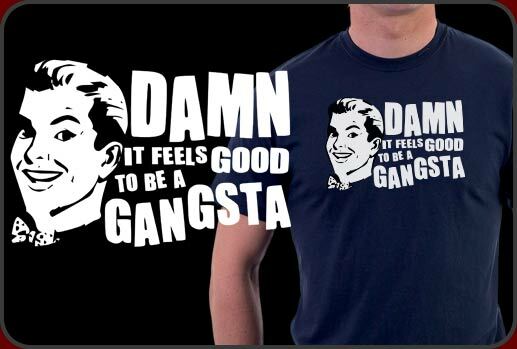 The Damn it feels good to be a gansta shirt is one of our most hilarious shirts on the site. It features a good natured young caucasian male rendered in beautiful retro 50s style and the words from the hit Geto Boys tune, Damn It Feels Good To Be A Gangsta. Definitely loaded with good humor and attitude, our Damn It Feels Good To Be A Gansta shirt looks as great as it feels. The design is available for both light and dark shirts too so you can choose anything that suits you best. We have our Damn it feels good to be a gangsta shirts available for men, women and even kids shirts and have some really cool mugs and posters and a other surprises with this design as well.